LOWELL, Mass. -- The No. 7 ranked UMass Lowell hockey team downed UConn, 6-4, on Wednesday night in Hockey East play at the Tsongas Center. With the victory, the River Hawks improve to 9-3-3 overall (6-0-2 Hockey East) on the season, while UConn falls to 3-8-4 and 2-4-1 in league play. Tonight's game marked the first time UMass Lowell faced the Huskies as a member of Hockey East. The River Hawks have now won 10 of the last 11 meetings against UConn. Sophomore forward Dylan Zink (Madison, Wis.) got the River Hawks on the board first with his third goal of the season on the power play just 5:45 into the opening period on a wrist shot from the right point. Freshman defenseman Chris Forney (Thief River Falls, Minn.) scored his first career goal five minutes later to give the River Hawks a 2-0 lead. UMass Lowell went into the locker room with a 2-1 lead at 1st intermission after UConn's Jacob Poe scored his first of the season on the power play with 5:07 left in the first period. Freshman forward Michael Louria (Wexford, Pa.) scored on a wrist shot from the left faceoff dot for his third of the season at 13:51 on the second period. UConn's Joona Kunnas and freshman forward Ryan Collins (Newton, Mass. ), who scored off a rebound, traded goals late in the middle stanza to make in a 4-2 game in the River Hawks favor. Sophomore forward Evan Campbell (Port Coquitlam, B.C.) gave the River Hawks a 5-2 lead with 6:41 left in the game, but UConn came storming back with goals by Evan Richardson at 11:45 and Trevor Gerling at 16:53. Adam Chapie (Oxford, Mich.) sealed the win for UMass Lowell with 11 seconds left in the game with an empty-net goal for his third of the season. UMass Lowell outshot UConn, 33-24, for the game, including a 11-4 advantage in the second period. Junior goalie Kevin Boyle (Manalapan, N.J.) stopped 20 shots in his sixth win of the season for the River Hawks. Rob Nichols made 27 saves in the losing efforts for the Huskies. 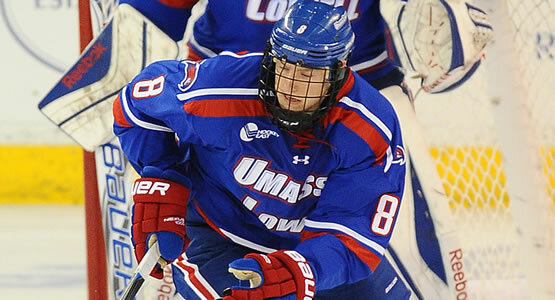 The River Hawks return to action on Saturday, December 6th against Maine at the Tsongas Center. Game time is 8 p.m. and will be televised nationally on NBCSN.